Demining allows development. Before schools can be built or crops can be planted, the mines must be cleared. MAG anticipates another 25 million square meters of land in Moxico province will still need to be cleared at the end of this year. Until that work is done, Angola cannot fulfill its destiny. In Maputo at the 2014 Review Conference of the Mine Ban Treaty, the countries that have joined the Treaty, including Angola, committed to making a landmine-free world by 2025. This would be a very good thing and in a future post I will explore what it will take for Angola to meet that target, but a mine-free world is not an end point in and of itself. A mine-free world allows everything that we might take for granted in the United States to happen: houses to be built, land to be used, paths to be taken – life to happen. And it starts with mine-free communities. Our merry party has grown: the Deputy Chief of Mission for the US Embassy, Connie, and the Dutch Ambassador to Angola, Willem, have joined up and Connie will be with us for the rest of the trip. Willem comes with a security detail provided by the Angolan national police which adds another four people (who come with a police truck and siren which they have mercifully not used yet). We are in Luena, capital of Moxico province which had been a UNITA stronghold during the civil war and was where Jonas Savimbi was killed in 2002, effectively ending the conflict. Luena is a planned city which has never caught up to the plan, but the wide boulevards and Portuguese architecture are appealing for casual strolls. MAG has been working in Moxico province since 1994 and done an awful lot in that time. Like NPA and HALO, they are operating at lower capacity than in the past, but with new leadership in country and increased attention from the headquarter’s fundraising team, they are hoping to turn it around. And be able to hand over more cleared minefields to the community. Today we are in Lingonga minefield and visiting the Calapo school which had been built on the minefield after MAG cleared. Calapo is near a river and along the main road out of Luena. During the civil war, the bridge was a strategic point and the Angolan army laid mines along both sides of the river. In 2008, a government demining team cleared the roadway and the space for the bridge, but the minefields along the river were left mostly intact. MAG started working on the site in 2014 as the river is a major water collection point and while we were there we could see several people washing their clothes in the river just a few yards from the bridge. They were now safe to do as MAG had cleared all of the mines on the southern side of the river and had begun work on the northern side of the river. The minefields on the south side of the bridge are called Lingonga East and Lingonga West. Lingonga West had been further divided into the Alpha and Bravo minefields. The Bravo minefield, where the Calapo school had been built, was handed over to the community in 2015. Today we were handing over the Lingonga West-Alpha minefield and the Lingonga East minefield. We did the usual minefield tour with MAG: briefing, don the PPE gear, walk the minefield and blow some stuff up, but for the me the draw was to see the end product, what could be done once a minefield had been cleared. Moxico’s vice governor told us that this area had been prioritized for clearance by the local government as the population was growing from refugees returning from Zambia and the Democratic Republic of Congo and Angolans returning to Moxico. The Brigadier told us that in 1986, when he was serving in the army in this area, there were no people living here (the Brigadier was part of the engineering corps which laid the landmines in the minefields that MAG was clearing; the Brigadier was able to draw maps from memory that have proven useful to MAG). After the tour, we headed to Calapo school. The students and the community came out to greet us. The school has 6 teachers and 300 students who attend classes from 8 am to 3 pm with an hour’s break for lunch. If the minefields had not been cleared and the school been built, those same children would have gone to a two-room school compared to the 14 classrooms they have now. The local administration has also secured new school books and desks to fill the classrooms. During the handover ceremony, MAG’s technical field manager, a burly South African who goes by “H” and lost an arm to a roadside bomb in Afghanistan, recalled that when he and his team first came to the Lingonga minefields in 2013, “We promised you we will finish [demining] the area and today, I promise you we are finished with this side of the river.” MAG cleared 110 anti-personnel mines from the grounds where the school stands, an area of 95,000 square meters. H also told the assembled parents, community leaders and regional administrators, “We are now working to clear the other side of the river [of landmines].” The minefields on the north side of the river are well known to the community, a boy having lost his life in one of the fields a few years earlier. In gratitude, the school children, dressed in their uniforms despite it being a Saturday, sang the welcoming song on our arrival and departure. You can hear the song on YouTube here . This is why we clear landmines. These children were born after the end of the war and they should not have to live with its after effects: Angola’s war should be part of its history, not its present. Every year, thousands of men, women and children are killed or injured by landmines in dozens of countries around the world. The only way to ensure that these injuries and accidents stop is to completely remove all landmines from the ground, an expensive and time-consuming process. Well, we’re going to help get a few more landmines out of the ground and hopefully have a little fun doing it. In honor of International Mine Action and Awareness day, I’m happy to announce that on Thursday, July 4th 2013, Landmines in Africa will host the second annual “This Frisbee Clears Mines Tournament,” an Ultimate Frisbee tournament, with support from the Washington Area Frisbee Club to benefit MAG America‘s landmine clearance activities. Last year, Team Libya (pictured to the right) won the tournament while raising almost $750. This year’s Tournament will take place at Anacostia Park in Washington, DC; all participants should arrive no later than 9:30 am for registration and team assignments. The tournament is open to all and will follow a “Hat Tourney” format. What’s a Hat Tourney, you say? In a Hat Tourney, all the participants show up at 9:30 am, put their name in a hat and from that hat, names will be drawn to form 15-person teams. Those teams will then be put into groups and play three games each. If there are enough teams, we’ll have a final championship match. Since the Tournament is on the Fourth and what’s the Fourth without a barbecue, we’ll have some grills going for lunch and snacks. MAG will have a table in case you want to learn more about landmines and their work. To register, you can either show up on the Tournament day with your $20 donation to MAG America, or you can pre-register by making your $10 donation via Tournament’s dedicated First Giving page. You should feel free to donate more, if you so choose or if you can’t make the tournament, but want to contribute, your support would be welcome. For more information about the tournament, please email me at michael.patrick.moore@gmail.com. To register, please visit our First Giving page. For more information about MAG America, please visit their webpage. For more information about Ultimate Frisbee and the Washington Area Frisbee Club, please visit WAFC’s webpage. For more information about landmines and mine action, as well as information about other landmine awareness raising activities, please visit the US Campaign to Ban Landmines webpage and the Lend Your Leg campaign website. Thanks, and I look forward to seeing you on the 4th! Last night I attended the United States premiere of the documentary, “Surviving the Peace: Angola,” produced by MAG America. The film, created by the firm Media Storm, demonstrates the impact of landmines on Angola and MAG’s efforts to rid the country of this scourge. Through three characters: Eron, a former soldier and now a deminer; Minga, an eight year-old girl who had been injured by a mine three years before the film was made; and Minga’s grandmother who raises her, the film shows hope (in the form of Eron), but also the terrible toll landmines can take on individuals (Minga), their families (her grandmother) and communities. The filmmakers inter-cut scenes of Minga and her grandmother with scenes of Eron working in the minefields. In the scenes with Minga and her grandmother, we watch as Minga learns to read and write despite having been blinded by a mine. We hear how Minga’s grandmother fears for Minga’s future (she tells Minga that one day Minga will be on her own and have to care for herself), but also how Minga’s grandmother has lost her livelihood having to look after Minga full-time. Minga tells us how she was injured: in an all-too-frequently-told-story, Minga came upon a “tuna can” in a field and poked it with a stick. For dramatic effect, the filmmakers have been showing scenes of explosive disposal as Minga talks, culminating with the detonation of several shells and landmines, just as she tells us she poked the can with a stick. We see the blast of the unexploded ordnance as we are forced to think of a five-year old girl setting off a landmine in a field. The film is part of a new campaign by MAG America to raise US $100,000 to support mine-risk education in Angola to help prevent future injuries like those Minga experienced. In a brief segment of the film, we see MAG staff teaching a classroom of children from Minga’s village about the dangers of landmines and specifically using Minga’s experience as a cautionary tale. In 1997, a scientific meeting at the Massachusetts Institute of Technology agreed that “the most reliable demining method” was the use of a metal detector by a human operator. However, the meeting also noted that metal detectors were subject to very high rates of false positives, with as many as one thousand false positives for every real landmine discovered. The meeting also raised the fear of all-plastic mines which would be undetectable by even the most sophisticated metal detector (MIT Technology Review). There have been two lines of response to these concerns: legal and technical. The legal response is housed in the Amended Protocol II of the Convention on Certain Conventional Weapons. 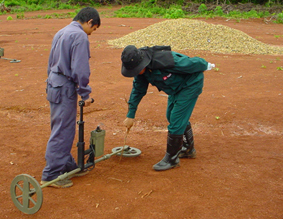 The Protocol states, in its technical annex, that all anti-personnel landmines produced after January 1, 1997 must be detectable by “commonly-available technical mine detection equipment,” such as a metal detector through the use of materials that would produce the same or stronger response as 8 grams of iron. Any anti-personnel mines produced before January 1, 1997 must be retrofitted with materials or a device that would produce the same or stronger response as 8 grams of iron. Unfortunately, states could defer compliance with the directive to retrofit pre-1997 mines for 9 years after entry into force of the Protocol, which meant that states had until December 3, 2007 to retrofit their plastic mines and states were only required “to the extent feasible, minimize the use” of plastic mines until that date (United Nations, pdf). Therefore plastic anti-personnel mines could easily have been used for many years despite the legal response (and plastic anti-tank mines have never been regulated). The technical response has been varied. In our last post we covered some of the proposed solutions (bees, mice, nanofilms, oh my! ), but other developments have also emerged. The United States Navy has issued a call for prototypes of handheld landmine detectors capable of locating mines with little or no metallic content, basically plastic landmines. The Navy feels that currently available landmine detectors “could be redesigned with lower size and weight with no loss in capability.” The Navy wants these prototypes for use by Special Forces and not for the general public (Military & Aerospace Electronics), but if the technology is effective, I would hope it becomes available to humanitarian demining. This call also made me curious about the current state of the art in metal detectors, so I did what anyone would do: I went to the local arms show. Last year, I went to the Association of the United States Army’s (AUSA) exposition which is one of the largest arms shows in the world. 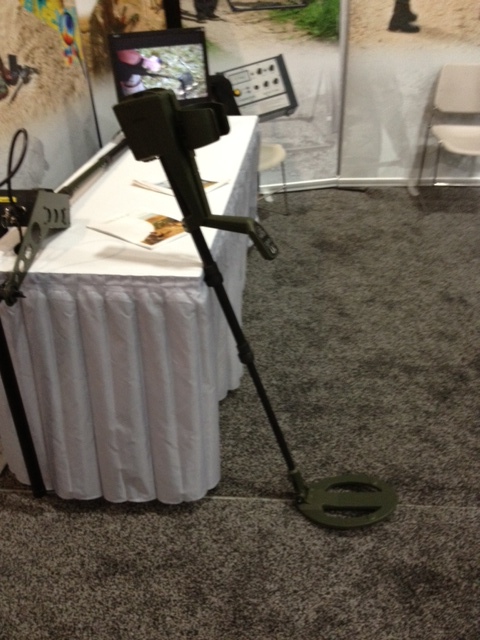 There I checked up on the new spider mine system designed as an alternative to persistent, victim-activated landmines. This year, I wanted to see the mine detection tools on offer and visited two vendors, CEIA-USA and Foerster. Both make similar devices that are widely used within the humanitarian demining community. The GICHD also profiles CEIA’s MIL-D1 which has 16,000 units in the field in many countries including Burundi, Djibouti, Egypt, Eritrea, Ethiopia, Kenya, Mozambique, Morocco, Namibia, Senegal, South Africa and Sudan. Giovanni Giustino, the Sales Manager at the AUSA exposition, told me that CEIA’s products are used by Mechem, the South African demining organization and Mines Advisory Group has co-sponsored a Death Valley Challenge, a 200 mile cycling trip, with CEIA to raise funds (Mines Advisory Group). Giustino was also kind enough to invite me to CEIA’s Italian headquarters for training in the use of their detectors, an offer I would love to be able to accept one day. In addition to the MIL-D1, CEIA also showed me their MIL-D1/DS (pictured below) which is specially designed to locate unexploded ordnance like cluster munitions and is being used by Mines Advisory Group in Laos (Mines Advisory Group). Both CEIA’s and Foerster’s metal detectors are “smart” machines with built-in electronics to adapt to, or “learn” the local soil conditions. If the local soil is high in iron ore, the detectors will adjust and compensate to the background level rather than give off a continuous indication of the presence of metal. Both manufacturers’ detectors can locate the minimum metal mines required under the Convention on Certain Conventional Weapons and their widespread usage and lack of known faults suggest that these and similar products will continue to be the basis of humanitarian demining. One final note, barely 100 feet away from Foerster’s booth at the AUSA expo one could find Textron Systems booth; Textron being the manufacturer of the new alternative anti-personnel landmine system. So within a few steps you could see the latest landmines and their detection systems. In honor of International Mine Action and Awareness day, I’m happy to announce that on Wednesday, July 4th 2012, LandminesinAfrica.org will host the “This Frisbee Clears Mines Tournament,” an Ultimate Frisbee tournament, with support from the Washington Area Frisbee Club to benefit Mines Advisory Group‘s landmine clearance activities. The Tournament will take place at Anacostia Park in Washington, DC; all participants should arrive no later than 9:30 am for registration and team assignments. To register, you can either show up on the Tournament day with your $10 donation to Mines Advisory Group, or you can pre-register by making your $10 donation via Tournament’s dedicated First Giving page. You should feel free to donate more, if you so choose or if you can’t make the tournament, but want to contribute, your support would be welcome.